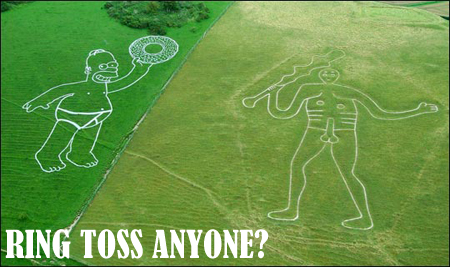 According to the Sun (the magazine, not the celestial object), a very large outline of Homer Simpson was made next to a pagan outline dating back to the 17th century. Of course, this was purely a publicity stunt to promote the upcoming Simpsons movie, and they claim that the paint will wash it away when it rains. Definitely an original idea to promote the much anticipated movie, though I don’t know how “family friendly” some of your more conservative viewers are going to take this. But cheers to their advertising agency for a rather creative idea. Check out this Simpsons trailer, parodying the next Die Hard movie due out this week (Live Free or Die Hard). I’m not sure if it’s a legitimate movie trailer for The Simpsons Movie or a fan mashup, but the footage looks fresh and well presented so it just might be the real deal. Anyways, it fairly entertaining and contains some footage you may or may not have seen yet. Enjoy! **Update** Sorry guys, it’s been brought to my attention that this video has been taken down. If you haven’t gotten a chance to see it yet, keep checking back at FavoriteHero.com and we’ll see what we can do for you. Thanks for stopping by! You are currently browsing the archives for the Homer Simpson category.